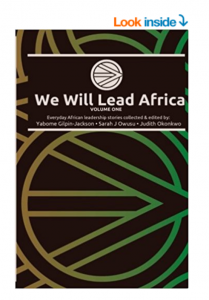 The We Will Lead Africa book series is edited collections of stories about the work and impact of everyday Africans who are leading change and transformation on the continent. It includes stories of capacity building, innovation, action and progress with a demonstrated impact on the continent; representing all geographic regions of Africa and a variety of socio-cultural and industry sectors. Submission deadline for our 2018 call for stories on Governance and Women, is 31st August 2018, midnight CAT. All stories should meet the submission criteria that follow and use this Submission Form as the cover sheet for their story (also submitted in Microsoft Word format). Story length: 1500 – 2500 words. Should be submitted in Microsoft Word, single-spaced. All pages should bear the title of the contribution and name/s of the author/s and the submission accompanied by the attached Submission Form. We are accepting stories expressed in a number of mediums - if you wish to submit a story in a different format, please email us with a brief explanation of your idea so we can discuss how to include you. have recently done (in the past 3 years) or are currently doing governance work in any African country that is already showing outcomes or making a difference as defined by you and/or the group you are working with. You may also interview others who have done / are doing the work, and submit a story on their behalf. If you would like to tell someone else’s story, you must have their confirmed permission in writing or where not possible in writing, their recorded verbal consent. In addition they must be listed as a co-author. Stories by people who identify as women will have priority, but stories by men may also be included if they document examples of leadership by and for African women. What inspired you to start/do the work you are doing? What was the challenge you sought to address or potential you sought to unlock? What have been the outcomes and impacts of the work to-date? The book is aimed at a broad audience so the use of jargon and acronyms should be limited to those strictly necessary for the argument, and if used should be spelled out the first time they are mentioned. Citations should always be accompanied by precise references and anecdotal information provided may be fact-checked. Graphics or images that enhance the story are encouraged – you must have permission to use these, and they must be submitted separately in high resolution. All stories will be reviewed by the editorial team, who reserve the right to accept or reject submissions. Representation of stories from a variety of sectors and disciplines. Note: Although ALL stories will be given full consideration, preference may be given to stories that would otherwise / usually go unnoticed or unheard. By submitting a story you acknowledge that the intent is to publish selected stories within a We Will Lead Africa volume and other publications, at which point you will be expected to sign over rights. Upon submission you will be sent an acknowledgement of receipt. All submissions will be given full consideration and will receive a response, whether they are accepted or not, but detailed feedback on rejected stories may not be possible. Authors of final accepted submissions will be asked to sign a contributors’ agreement before publication. Submission schedule and timeframes subject to change and will depend on number of stories submitted. We expect to publish volumes in mid-2019.